I love the maxi skirt trend so much right now, I can't get enough of them. Especially with winter around the corner I want to stock up. I love long skirts for "Forgot to shave my legs days," or days that are too cold. With the trend growing I feel like some places are SO overpriced! I just can't spend $50 on a skirt, that is outrageous! Luckily I know someone with better prices. My friend owns Silver Apple Boutique. She went to China last year to do some research and opened earlier this year. She has cute dresses, skirts, necklaces and shirts. The best part is that she has them for so much cheaper than anywhere else. When we went to California the new high-low skirts were everywhere. I came back wanting one, especially for beach and swim wear. Silver Apple Boutique has tons of cute colors and they are perfect for fall. The black ones are great because they can go with so much. Plus you can dress them up with a nice pair of heels, or dress them down for an easy day with flip flops. I asked what her most popular item was and she said her chevron prints, hands down. Plus I love all the mint and coral colors. That is why I love this maxi dress, it's the best of both worlds! I could wear it with my mint green cardigan I wore in my above picture. She often gets asked, "How do you match with all these fun bright skirts?" Easy, not matching is very in. You can throw together so many different colors together and they work great. Here is a great article on color blocking. It has a color wheel to help you see how so many different things go together. The article clearly states clashing is OK and very popular! These plain colored maxi's are great for lots of patterned or colored tops. I'm a cardigan girl myself, so this fall I will be rocking this with a bright lace yellow cardigan, or maybe even red and orange, who knows? Another popular thing that I love is the Aztec/tribal prints. When I saw she had this one I texted her to save me one because I knew they would go fast! Isn't it cute? So jump on the maxi skirt band wagon, and stock up. Silver Apple Boutique not only has the best prices, but is constantly getting new things in. Follow Silver Apple Boutique's facebook page for updates, products and giveaways. Silver Apple Boutique is also sponsoring a giveaway for a free maxi, skirt, woot woot! Make sure to enter using the rafflecopter below. Giveaway closes 8/21//13 at 12:00 AM. Winner will be announced with in 48 hours of closing. Winner has 48 hours to respond or new winner will be announced. I received a complimentary skirt in exchange for my honest review. No other compensation was received. I love the Chevron Block Knit Maxi Skirt! I like the STRIPE PRINT KNIT MAXI SKIRT in black! I love the high low maxi in black....and jade...I can't decide!! I love the white stripe maxi in baby blue! I love the chevron knit maxi skirt! mint and coral colored dress or skirt would be to die for!!! I love it sosooo much! I like the solid black maxi skirt. I would choose the Stripe Print Knit Maxi Skirt. I love the white stripe maxi skirt! I want the black and white stripe print maxi skirt! I like the CHEVRONBLOCK KNIT MAXI SKIRT in Heather Gray . Thanks for the great giveaway! I'd have to say the teal colorblock skirt. Their dresses are so cute too! I love high to low skirts but really love the black and white color block skirt. 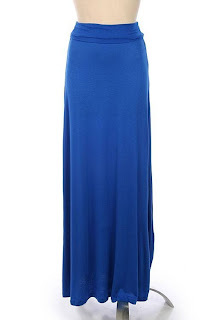 And a solid blue maxi. I like the white stripe maxi skirt! I like the HIGH-LOW KNIT MAXI SKIRT in black! i am obsessed with the tribal print! I'm loving the colorblock knit maxi skirt! Love the COLORBLOCK KNIT MAXI SKIRT in teal! I like the HIGH-WAIST CHEVRON PRINT SKIRT. I would choose the CLOUD TIE DYE or the CHEVRONBLOCK KNIT maxi. HIGH-LOW KNIT MAXI SKIRT in Black! Solid Color Maxi Skirt in black. It would match everything! I like the cloud tie dye knit maxi skirt. I love the black/white and the aqua/coral--actually, I love all of them! Love the Colorblock knit maxi in teal! I'm loving the first coral skirt you have on your site!! I like the CLOUD TIE-DYE KNIT MAXI SKIRT and the HIGH-WAIST CHEVRON PRINT SKIRT. Gorgeous! I love MOST of their skirts, but I think my favorite is the STRIPE PRINT KNIT MAXI SKIRT in black. Thanks! I love the mint and coral colored maxi skirt. 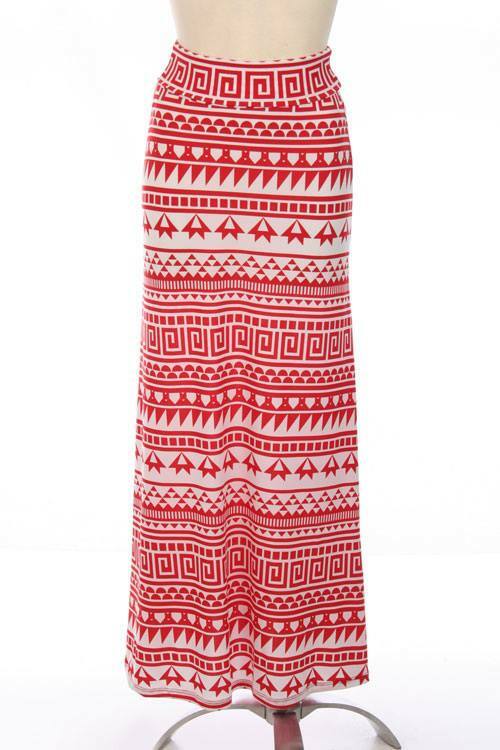 Or the red and white aztec maxi. It would be a perfect transition into fall. I am a fan of HIGH-LOW KNIT MAXI SKIRT in coral, or peach! Love the cloud tye-die maxi knit skirt! I would LOVE to own CLOUD TIE-DYE KNIT MAXI SKIRT. It's stunning! I really like the look of the colorblock knit maxi skirt. I love the jade high low skirt. I like the tye dye maxi skirt. I like the white stripe maxi! i like the HIGH-LOW KNIT MAXI SKIRT in Jade. Black and White strip is adorable. I like the blue one above! I would choose the high-waist chevron print skirt. I love the solid color maxi skirt in black. The White STripe Maxi is super cute! I, like many others, love the Solid Color Maxi in black. I also liked the Color Block, I just think the solid black would go with everything! I like the pink Cloud Tie Dye Knit Maxi. Gorgeous! I love the CHEVRONBLOCK KNIT MAXI SKIRT in grey, its so cute and looks so comfy! Oooh. I NEED a new skirt!! Love the color block, love the plain, love them all! I absolutely love the high waist chevron print skirt in royal blue! love the cheveron and I want one sooo bad. Thanks for the chance. I like the white striped skirt and the pencil skirt. I like the stripe print knit maxi skirt. I like the solid color maxi skirt in aqua. 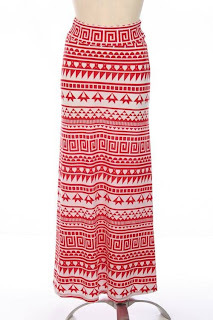 Love the red and white aztec skirt! I love the CHEVRONBLOCK KNIT MAXI SKIRT in green and gray. I like the high waist chevron skirt. I love the HIGH-LOW KNIT MAXI SKIRT in Black! I love the Solid Color Maxi Skirt in black! I love this green top and I think it would be flattering on me. HIGH-WAIST CHEVRON PRINT SKIRT is awesome! COLORBLOCK KNIT MAXI SKIRT in teal or off white. I think my favorite is the cloud tie-dye knit maxi. THANKS!